Have you seen a Gas Giant wandering aimlessly through space? Our solar system might have lost it while dealing with some dynamic instability 600 million years ago. 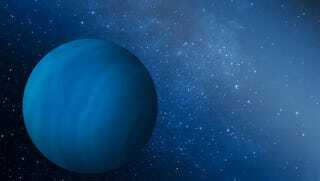 It might be blue, is probably big and is believed to be somewhere deep in the Milky Way Galaxy. Not to be confused with Tyche, which may or may not be hiding/captured in the Kulper asteroid belt along the outer reaches of the Galaxy, this nameless planet was first noticed missing yesterday when the Southwest Research Institute revealed data from simulations showing the evolution of planetary orbits only make sense if there was a 10th (9th? 11th?) planet hovering around in the solar system all those years ago.